Sheet forming’s key man was the vatman. 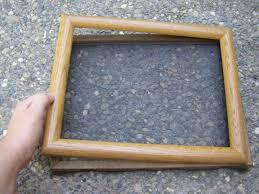 He used a mould formed of a bronze wire mesh and a wooden frame to cover it called a deckle. Working right next to the vatman, but not illustrated would be the coucher. His job was to form a stack of (very damp) sheets. He would take the mould, without the deckle which the vatman retained, and carefully invert it to allow the sheet to drop off onto his growing stack (post) separating each sheet with a felt to absorb more moisture. From the moment the vatman takes the mould out of the vat, paper making amounts to removing water without disturbing the fibers. After the coucher has built up a post it would be passed on to the layer who would begin building another stack, this time of paper only. He would take each sheet off the felt in the post and transfer it to a separate pile, handing the felts back to the coucher. The layer needed to be able to build a neatly aligned stack with a quick motion, not tearing the corners or leaving fingerprints. 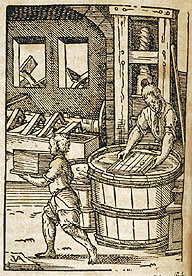 After they had accumulated enough sheets the stack would be put into a screw press in order to extract water. The press can be seen in action in the lower left hand corner of the engraving above. If the paper was to have a watermark, this would be incorporated into the mould. 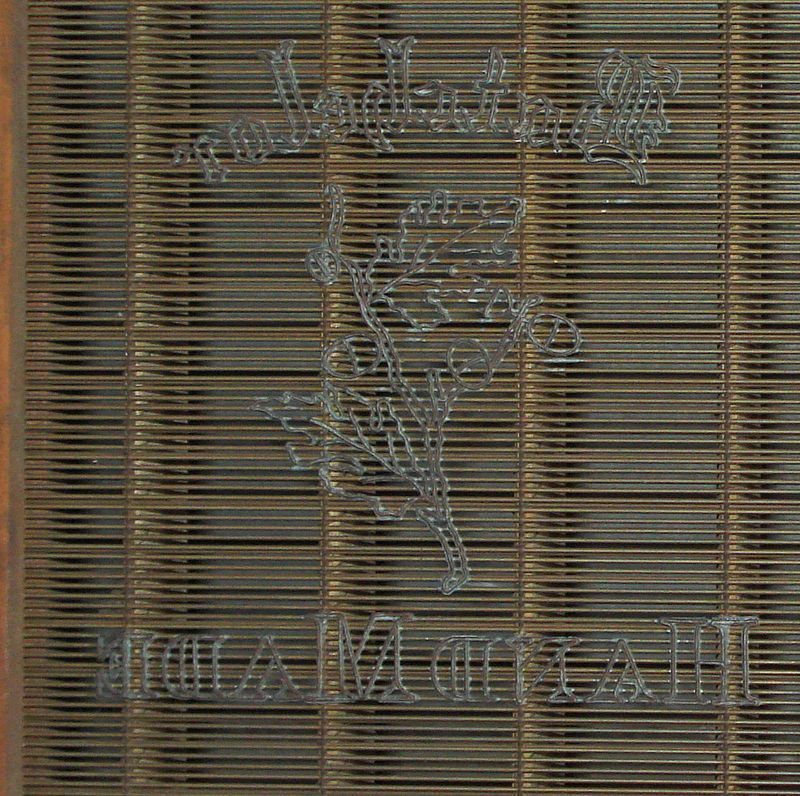 The illustration below shows a mould from Hayle Mill with a quite elaborate wire watermark woven into it. (The video of Hayle Mill shows them making watermarks.) The watermark simply makes the paper a little bit thinner in the areas where the extra wire is placed, thus making the paper a bit translucent, so you can see it when you hold it up to the light.